This tutorial explains how to email a group of students, or their parents, through edumate. Groups can be anything from year groups to individual classes or extra-curricular activity groups. 1. 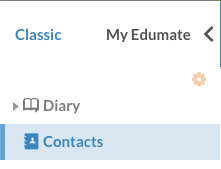 From the edumate menu , click ‘Classic’ then click ‘Contacts’. then choose the group you wish to contact. You can contact forms, classes, co-curricular groups amongst other things. If you click search type and choose ‘Student Status’ and then choose ‘Student Current Enrolment’ you can email all current students at Danebank or their parents. If you choose ‘School’s you can email just the junior or senior school students/parents. 3. You will see the members of the group you have selected appear in a list. If you want to email individual members of the group you can tick them in the left hand column, however if you leave all members unticked, then communications will go to all members. In the top right hand corner, click ‘Communicate’ then ‘Email’. 4. A new window will pop up for your email content. Important: The ‘To’ defines whether this email will go to students or their Parents. 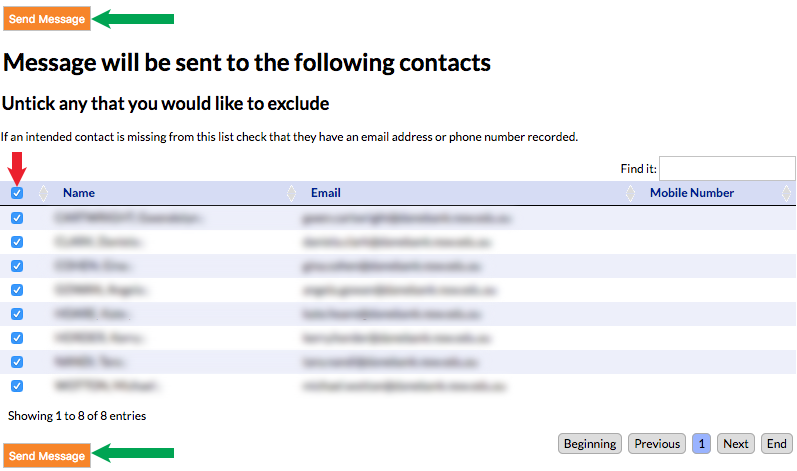 To Email Students – check the first circle labelled ‘Contacts’. To Email Parents – check the second circle labelled ‘Mail Carers’. n.b. ‘Report Carers’ should only be used by admin/exec staff regarding essential school communications that must reach all parents/carers regardless. ‘Lives with’ Carers should only be used by admin staff for communications relating to transport/travel/uniform issues that would only concern parents/carers at the student’s primary residence. The ‘From’ will default to your email address, however if you do not want parents/student to be able to reply to you or see your name as the email sender, you can change the first field to ‘Danebank’ and the second to ‘noreply@danebank.nsw.edu.au’. 5. When writing the body of your email, there are various ‘variables’ that can be used for group emails that will extract parents names and salutations as well as student’s names which can be useful for personalising group emails and are demonstrated below. 6. Once you are ready, click ‘Generate’. This will not send the email yet, but show another screen asking you to confirm the recipients before sending. Another screen will appear asking you to confirm your recipients, you can review the email recipients are the students/parents as designated above, and manually exclude anyone you wish by unticking their name. Once you are ready to send, click ‘Send Message’.